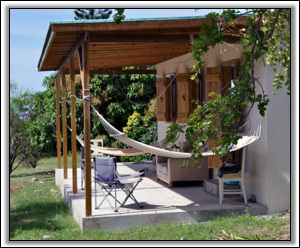 Hamliton Lodge Cottage - Nevis Island West Indies - An affordable two bedroom cottage. Nevis Luxury Cottage Rental - Hamilton Cottage is a an affordable 2 bedroom cottage with great views of the sea, and close to the best beaches on Nevis. 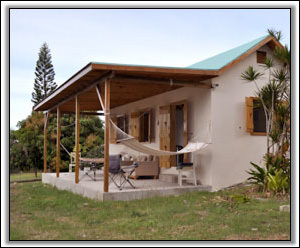 The cottage at Hamilton Lodge is a newly renovated Nevisian style cottage set in two acres of tended grounds rich with tropical flowers and trees. The cottage is hip-roofed in the West Indian style with bright blue galvanized tin and has a large 30 ft verandah. It has shuttered windows, overhead fans and high wooden ceilings to ensure it takes advantage of the cooling trade winds. The cottage has two spacious bedrooms, 1 bathroom and a well-equipped kitchen. It is perfect for a family holiday home. The house is situated within striking distance of Charlestown, 5 minutes from the Four Seasons with its renowned golf course and 5 minutes by car to Pinney’s Beach. Five minutes up the hill is the well-regarded Bananas Restaurant. 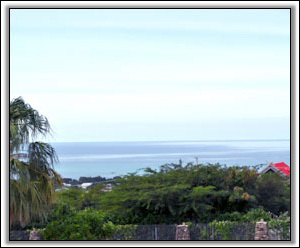 Its position in the centre of the island just above Charlestown ensures easy access to all that Nevis has to offer; 10 minutes drive and you are in Oualie Bay; 10 minutes the other way and you are enjoying the breathtaking views from Gingerland. 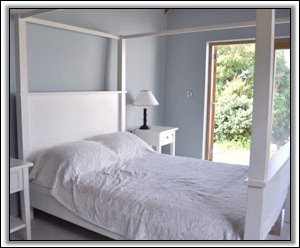 The Master bedroom features a King size four poster bed with memory foam mattress. It is netted for comfort. 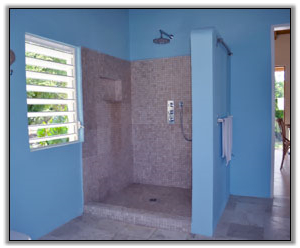 Adjacent to the master bedroom is the bathroom, tiled in travertine with a waterfall shower. The second bedroom features twin single beds separated from the kitchen by a hand painted Indian screen. Both beds have memory foam mattresses and 100% cotton sheets. 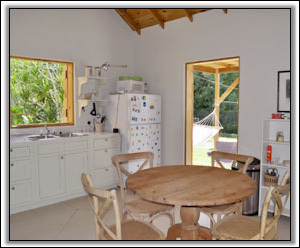 The hand built wooden kitchen has a large fridge/freezer and stove and a pine table that seats four people comfortably. Outside, the 30 ft verandah is equipped with hammocks for lounging in and outdoor chairs for visitors to be able to enjoy the tranquility and privacy of the enclosed garden. The cottage is equipped with high speed Wi-Fi broadband internet. It is intended to provide a quiet getaway for those who enjoy the simple pleasures of the laid back Caribbean lifestyle. All linen is provided. A rental car can be arranged to be delivered to the house.